How do I dispose of the oil from our fried Thanksgiving turkey? In my former life I worked in the Water Quality Division of a regulatory agency. My duties included finding sewer overflows and tracking down the source. The running joke in my family was that I spent 6 years in college (this includes a Masters program) to chase poo. Its sounds funny but this was important work because sewer overflows are a major source of contamination in our waterways. So what does me chasing poo have to do with a fried Turkey? Well, it takes 3 to 5 gallons of oil to fry a turkey and afterwards this oil must be disposed of. Most of the time our first instinct is to dump the oil, either outside or down the drain. Both of these options can have negative environmental effects. Dumping any amount of cooking oil outside exposes it to the elements, there it can harm wildlife and make its way into waterways. Pouring oil down the drain can cause grease to cling to pipes causing clogs and massive damage to pipes and sewers. Recycling is the best option for disposing of leftover cooking oil. First drain the oil to remove food particles, then pour the oil into a sealed container. It can then be dropped off at your local recycler. If this is not available in your area, drop the sealed container into the trash can. Its not as “green” as recycling but still a much better option than the drain or backyard. I enjoy vegetables, but just the basic veggies that I am familiar with from my childhood. I would love to venture out and try something a little more interesting like asparagus (you have to start small :)) but I wouldn’t know where to begin with selection or preparation. So when I read that to reduce carbs in my diet I could try mashed cauliflower (another unfamiliar veggie) instead of potatoes I thought I would do a little research. It seems like cauliflower would be a great addition to my Meatless Monday repertoire. Cauliflower, a cruciferous vegetable, is in the same plant family as broccoli, kale, cabbage and collards. Raw cauliflower is firm yet a bit spongy in texture. The milk, sweet, almost nutty flavor of cauliflower is at its best from December through March when it is in season and most plentiful in your local markets. Cauliflower is an excellent source of vitamin C, vitamin K, folate and fiber. It is a very good source of vitamin B5, vitamin B6, omega-3 fatty acids, and manganese. Additionally, it is a good source of potassium, protein, phosphorus, vitamin B1, vitamin B2, vitamin B3, and magnesium. Cauliflower contains phytonutrients that release odorous sulfur compounds when heated. These odors become stronger with increased cooking time. If you want to minimize odor, retain the vegetable’s crisp texture, and reduce nutrient loss, cook the cauliflower for only a short time. To prepare begin by cutting cauliflower florets into quarters and let sit for at least 5 minutes to enhance its health-promoting benefits. Then to sauté cauliflower, heat 5 TBS of broth (vegetable or chicken) or water in a stainless steel skillet. Once bubbles begin to form add cauliflower florets (cut into quarters) seasoning (of your choice), cover, and sauté for 5 minutes. Mashed cauliflower tastes similar to mashed potatoes but with fewer carbs. Top with chopped herbs and grated cheese if you like. Surviving the holidays with family and friends can be a task for anyone, especially if your eating habits are non-traditional. The author of Choosing Raw offers tips to help vegetarians and vegans alike, survive the holiday season. 1) For the main meal (aka Turkey Day), bring a dish that suits your habits, be they vegetarian, vegan, generally health conscious, or raw. Make sure it’s a dish that’s palatable and appealing, and make enough for the table. Never assume that people won’t want to try it; if it’s good, they will! Share the dish with enthusiasm, and cross your fingers that your folks like it. If they do, you may just find them clamoring for more healthy options next year. 2) Plan ahead. Thanksgiving isn’t just aboutTurkey time; oftentimes, it means a weekend of travel and staying with relatives, or simply hours spent away from home. Make sure to bring snacks that suit you in addition to your contribution to the main meal. I never make day trips or overnights without Larabars or Pure bars, apples or bananas, a bag of baby carrots, an avocado or two, bottled juices and coconut water, and some homemade raw trail mix. Or, simply make a grocery trip on your way to the destination in question, and show up with tons of food that you can enjoy and share with the fam. 4) Know your limits. All of us have dietary preferences that are non-negotiable, and ones that aren’t. Holidays are a good time to familiarize yourself with the difference. I know some people who eat mostly vegan, but are willing to make concessions if a side dish has a touch of butter or cream; I know vegetarians who eat a tiny slice of turkey on turkey day. I have mixed feelings about these concessions, but I’ll admit that I have a few of my own. I always bring an all raw dish to parties and holiday meals, but if there’s a cooked vegan dish (especially one that a family or friend made with me in mind), I’ll certainly give it a try. Best case scenario? It’s tasty and healthy. Worst? I give the person who made it some joy by tasting. As long as it’s vegan, I can live with the fact that it’s not raw. I’m also happy to throw food combining to the wind, if necessary, as long as what I eat is vegan and not too difficult to digest. 5) If you’re dining out, plan ahead! Most restaurants will be packed to the gills and not happy about making unforeseen substitutions on turkey day. Make sure to call the restaurant at least a week in advance if you know you’ll want something that’s not on the Thanksgiving pre-fixe menu. Request something simple, like a plate of whichever veggies the chef already plans on serving, along with a small salad and a baked yam. Be firm, but try to work with the restaurant manager to find a hassle free option. Bring a good attitude to the table. If there’s one thing I’ve learned about raw and vegan dining at holidays or with family, it’s this: don’t arrive on the defensive. If you come to the dinner table tense, self-protective, and ready for an argument, you can be sure that an argument will find you. It won’t take long for family members—especially those that are wary of veganism in the first place—to sniff out your unease and challenge you. Yes, this is immature, and yes, they should refrain, but mark my words: it will happen. And when it does, you’re likely to become argumentative, self-righteous, or hurt. I hope this helps someone have a happier, stress free holiday! In my post yesterday I mentioned all the things that I have had to eliminate from my diet (like pizza and cream cheese). Well today my co-worker Jennifer opened my eyes to all the things I COULD have like dairy-free cheese. I thought it would be great if we could swap our favorite food alternatives! So if you’re vegan, gluten free, vegetarian, have a diet restriction or just plain don’t like an item, share your alternative. Post a comment completing the following statement, I don’t eat _______ I eat _________ instead. I LOVE pizza. The only thing better than pizza is pizza with extra cheese. However, since I’m nursing I have had to eliminate dairy from my diet, which includes cheese. So let’s have a collective moment of silence for my extra cheese pizza……. I’ve heard lots of suggestions for satisfying my pizza cravings, eat pepperoni as a snack, eat spaghetti (last time I checked pizza and spaghetti tasted different) and the most bizarre of them all; eat the pizza without the cheese. I have seen people order pizza sans the cheese but I am not one of them. 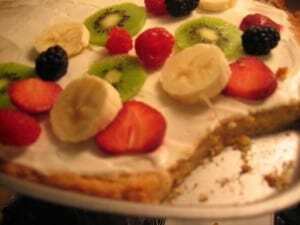 So when looking for Meatless Monday recipes for today I came across this recipe for fruit pizza. I thought wow I’ll try this, definitely not an extra cheese pizza but looks delicious nonetheless. That’s until I realized the frosting included cream CHEESE. I still can’t have it but I thought I’d share it anyway…. 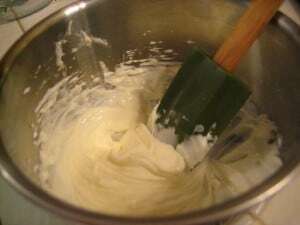 Cream butter and sugar. 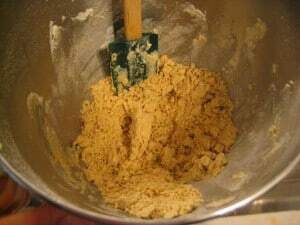 Stir in flour and finish by hand. 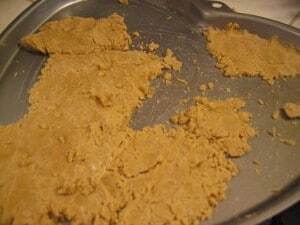 It might be very crumbly and you’ll think it will never come together, but persevere. 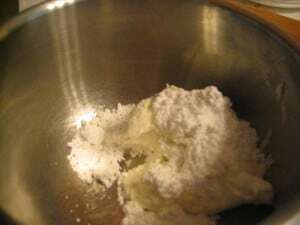 You can also go shy on the flour. 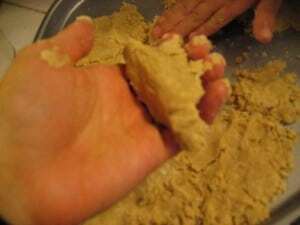 Once the dough comes together when you squeeze it, begin to press a handful at a time into a buttered pan. 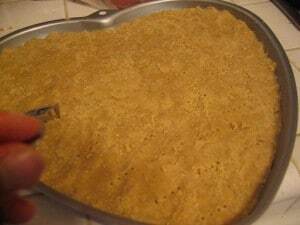 Mine happens to be a heart, but a small cookie sheet or even a 9×13 glass dish should work too! Aim for a thickness of about 1/4″. Bake in a 350-degree oven for 15-20 minutes. As soon as you see brown on the edges, it’s done! Watch the edges; they can brown quickly! Now for the fun part. 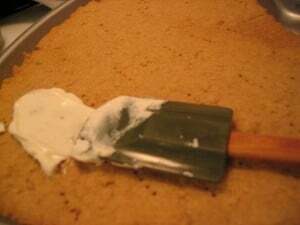 While the cookie crust cools, make the “frosting”. 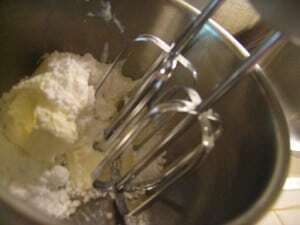 I just sprinkle some sugar on and taste to make sure the frosting isn’t too tart.